Leave gender at home, ladies. It has no place in the chamber. And, yes, I know that we have never had real representation in government, and that we clearly made progress in this last election. You want to continue to make progress? Then stand together as Americans in politics. Ask people to vote for the right person, and when those people are elected to government, let them show up in the chamber wearing appropriate attire that makes what they wear the adjective, not the noun. How would I feel if I were a man who voted for those women? Would I feel they were a reflection of me and a window into that which I aspire to be? 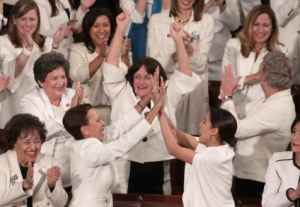 Giving the president a standing ovation when he mentioned them sitting there in a sea of white was demeaning to themselves. They are people elected to congress, not women elected to congress. I know. I feel the onslaught coming. We have waited so long. Of course our female gender will enter into our decision-making. And so will our religious beliefs, the economic circumstances in which we grew up, and our college experience. That doesn’t mean we wear our cross front and center, or the McDonald’s uniform that we wore working our way through college, or our university-logo sweatshirt. We show up in chambers ready to do the work of the people. Ready to listen carefully to the president’s words and mark them in our memory to ensure we can follow up when he doesn’t. If we—as women, as people, as Americans, as humans—want to succeed in bringing the country together to build great tomorrows, then leave things like wearing matching white outfits to other people.